Over the last two decades, a number of cinematic icons from the world of Asian film have made the leap stateside to launch Hollywood careers, such as Jackie Chan ("Shanghai Noon"), John Woo ("Mission: Impossible 2", Ang Lee ("Crouching Tiger, Hidden Dragon"), Michelle Yeoh ("Tomorrow Never Dies"), and Chow Yun-fat ("Anna and the King"). 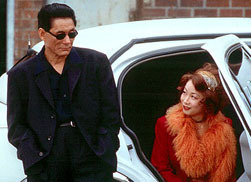 In 2001, they are joined by Takeshi 'Beat' Kitano (seen recently in the controversial "Battle Royale"), an iconic writer, director, and actor of Japanese film known for his unique brand of Yakuza pics. In "Brother", which opened stateside on a limited basis in the middle of July, Kitano (in his first time back at the helm since 1999's "Kikujiro") brings his trademark blend of 'silence and violence' to the streets of Los Angeles in a story about a dishonored Yakuza who raises hell after being banished to the United States. Unfortunately, other than a change of locale, Kitano offers little that is new or compelling with this latest effort. After a gang war turns sour, aging gangster Yamamoto (Kitano) leaves his native Japan for Los Angeles, where he ends up in the company of his half-brother Ken (Claude Maki). Ken has made a living in the underworld in partnership with an African-American drug dealer named Denny (Omar Epps of "The Mod Squad"). Though the operation is strictly small-time, this quickly changes once Yamamoto brings his extensive experience to bear on their little business. Pretty soon, Yamamoto, whom everyone affectionately calls 'Aniki' (which means 'brother' in Japanese), is leading aggressive attacks on the crew's rivals, such as the Italian Mafia, and importing his former colleagues, such as his loyal lieutenant Kato (Susumu Terajima of "Hana-bi"), to help out. In no time, Yamamoto's new gang is expanding into new territories and new lines of business-- unfortunately, this newfound prosperity comes at a heavy price. For anyone familiar with the films of Kitano, "Brother" unfolds in exactly the same manner, as a death-obsessed and world-weary protagonist wantonly pursues his goal, which ultimately ends with him and his associates meeting an untimely end. And characteristic of all his films, long and lingering shots devoid of sound and dialogue are shattered by spasms of shocking violence on a fairly frequent basis, leading to an extensive and bloody body count. Unfortunately, in the case of "Brother", there seems to be little meaning or reflection behind the on-screen violence, other than being a perfunctory gangland saga where the anti-heroes are done in by their own unbridled ambition. Another problem with the film is the lack of interesting dialogue. 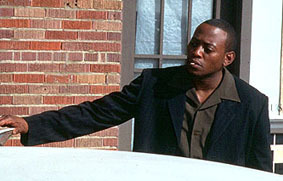 Given that the majority of the film is set in Los Angeles, most of the characters speak in English. Unfortunately, with Kitano's lack of fluency in the English language, his character is relegated to the use of a few functional words and facial expressions. In addition, it seems that Kitano wrote very little of the English script, since many of the conversations among the English-speaking characters seem to have been improvised, leading to stilted and aimless tracts of dialogue. For those curious about the films of the legendary Takeshi Kitano, "Brother" is not a fitting introduction to the master of 'silence and violence', as the veteran director has done much better work than this Hollywood-friendly gangland saga. Moviegoers might be better off renting "Hana-bi" and "Kids Return"-- films in which he has combined his penchant for blood-and-guts mayhem with some deliberate meditation on much weightier matters. Images courtesy of Sony Pictures Classics. All rights reserved.